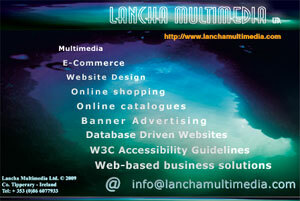 Lancha Multimedia Ltd. offers Internet & Multimedia business solutions to our clients. We will bring your organisation from an introduction to the Internet through to creating your Internet presence. We will offer advice on how best to represent your organisation in the digital environment. We endeavor to create multi-platform accessible websites through attractive and responsive website design using the latest technology to implement new concepts and ideas with creativity, efficiency and style, leading to content-rich, high quality and functional websites in different devices to target and impress your potential clients from all corners of the world. Lancha Multimedia Ltd. supports the creation of websites that are accessible to everyone, including those with disabilities. We adopt design and coding practices for accessibility, implementing international standards, including the Web Content Accessibility Guidelines offered by the World Wide Web Consortium (W3C). A major use of the internet is on-line shopping and this can be arranged so that you can sell your products or services directly to your customers. Development services include Responsive B2C Website Design, Responsive B2B Website Design, E-Commerce Websites, Content Management Systems, Social Media Integration and Search Engine Optimisation. We provide maintenance contracts that can be specifically tailored to your needs. We aim to ensure that your systems are operating to their optimum levels at all times. To fully exploit the rapidly evolving world of new media requires a broad range of skills. Our staff has an excellent practical knowledge of the issues involved in utilising the latest technologies in Internet & Multimedia. Our staff are highly experienced and have worked over the past 20 years in Ireland and abroad for a range of companies including large multinationals. You will receive the most personal and professional service at all times from us. Contact Us today for an objective appraisal on whether your business can benefit from the Internet and multimedia. We will, as always, be pleased to help you. We always strive to improve so we welcome any comments or suggestions you may have. © 2000 - 2015 Lancha Multimedia Ltd.